The Railroad system plays a large part in the route of the Tracks Across Borders Byway; it follows the route of the historical 1880s Denver & Rio Grande Narrow Gauge Railroad San Juan Extension, Colorado's first and the Nation's largest narrow gauge railroad system. The Southern Ute and Jicarilla Apache history and culture are also very important to this area; their Reservations are still prominent and there are various museums and monuments along the way to learn about their past. This route has some stunning views of canyon walls, sparkling waters of the Navajo River and Amargo Creek, and lots of greenery. Navajo State Park is a must see along the byway. Spend part of the day fishing, water-skiing, boating, wildlife watching, or camping. You might actually need more than just a few hours to experience all that the state park has to offer. Stop at the Chimney Rock National Monument for some amazing views of archaeological sites and rock formations. There are hundreds of excavated archaeological sites and most of them were living structures for the Ancestral Puebloan Indians. Take a tour of the sites or stop at the Visitor Center for some fun summer workshops. There are a few ghost towns along the byway: Pagosa Junction and Juanita. The Denver & Rio Grande Narrow Gauge Railroad passed through both towns when it was still running. There are water towers and hopper cars still visible. Parts of the original tracks still lie in Dulce. There is also some boxcars and old administration buildings. Some other fun things to do include visiting the Southern Ute Cultural Center & Museum, the Sky Ute Casino Resort located in Ignacio, Colorado, or taking a train ride at either end of the byway. 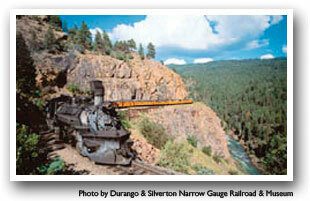 The Durango & Silverton Narrow Gauge Railroad is still running out of Durango heading north to Silverton. The Cumbres & Toltec Scenic Railroad is out of Chama, New Mexico and crosses the border connecting to Antonito. Location: The byway is 125 miles long in Southwestern Colorado/Northeastern New Mexico. Starting in Durango, Colorado, take Highway 172 south through Oxford, Ignacio, and Arboles. From here, take a quick jaunt up to Chimney Rock National Monument along Highway 151 and back down turning onto County Road 500 towards Juanita. You'll cross over the Colorado-New Mexico border and head towards Dulce, New Mexico. From Dulce, head to Chama along Highway 64.